Six different angels. Each has a different hair style, expression and paint detail. Make several to decorate your fireplace mantel or serve as your table centerpiece. Build them from 1/4" and 3/4" pine. All patterns drawn FULL SIZE. Projects measure 7"H to the top of the angels heads. 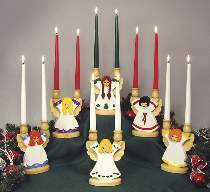 Angel Candles Hardware includes 12 candle cups, 12 brass inserts and enough 1/4" wood for the faces and wings for all six projects. Project plan, remaining wood and wood finish are not included. Order one hardware package to build all six angels or see Special offer which includes the plan and hardware.